One reads lots of surprising information on the internet. Sometimes a fact is given out of context and can be misleading and at other times the fact is part of a detailed article which seems well researched. Here are 8 things to do with marriage which I have recently 'discovered' and I trust they are true. Way back in ancient Greece if a man threw an apple at a woman he was proposing marriage. If the woman caught it she was accepting the proposal. Well, that was motivation to practice one's throwing and catching skills. How awful if a man threw the apple off target and the wrong woman caught it. 2. Why does the wedding ceremony end with the couple kissing? I always thought the kiss at the conclusion of the ceremony was a romantic gesture. Apparently not. Seems it goes back to ancient Rome where any contract was made final and legal with a kiss. A marriage was a contract, hence the kiss. In Australia 56% of weddings are currently performed on a Saturday. I thought it would be higher. It would be interesting to compare the figures over the decades as I am guessing in the past more weddings were carried out on Saturday, but I could be wrong. In Australia June is the month of fewest weddings, followed by July. Statistically, men who are short tend to have a harder time finding a wife. However, they are more likely to remain married when they do. Back in the days of slavery in Virginia an ex-slave had to move to another state once granted freedom. One woman who had recently been made free asked to be made a slave again because she wanted to stay with her husband who was still a slave. According to one source, (updated in March 2018) a fifth of divorce cases in the USA involved Facebook. Elsewhere I have read in 2011 as many as a third of divorce cases were linked in some way with use of Facebook. Whatever the statistic it appears Facebook isn't helping marriage. 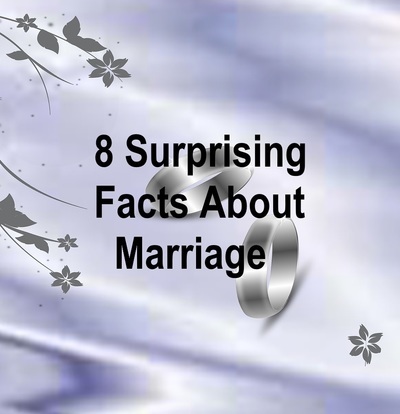 Marriage and the history of marriage over the years is full of surprising facts.